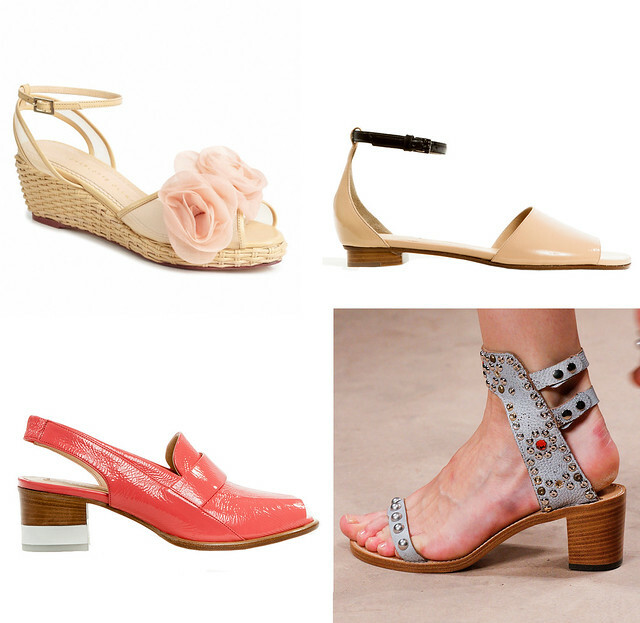 Photo credit: Vogue.com & ModaOperandi.com featuring (clockwise) Charlotte Olympia, Reed Krakoff, Isabel Marant and Reed Krakoff. I like clothes but shoes and handbags are my first and second love, though not necessarily in that order. I thought it would be neat to check out the latest designer shoes featured on the runway during the Fashion Week. Two hours later, I became somewhat disillusioned by the type of shoes I was seeing on the models' feet. Little wonder these young girls have a plethora of plasters and blisters on their feet. Sure, they have to squeeze into sometimes too big or small heels but most of these look like torture contraptions disguised as shoes. The pendulum swung from one extreme (flats) to the other end of the spectrum (very high heels). There were furry pumps from Celine that looked like it had contracted hypertrichosis and resembled a very colorful werewolf. I'm an admirer of Charlotte Olympia designs but the 6 inch pencil heels are deadly on the streets of England. Has the fashion world gone mad? The platforms are getting bigger and weirder and the heels are getting increasingly higher. It feels a little like the days when my grandmother had her feet bound albeit briefly. These women with lotus feet could barely walk and had to be carried everywhere. As I was walking back from the gym, I saw a woman clinging haplessly to her man while trying to cross the street in platform skyscrapers. Perhaps I'm being a little too practical here. What most women want is gorgeous heels, ones that we can walk in without keeling over in pain. I think Reed Krakoff and Isabel Marant got it right this time but the selection is still pretty slim on the ground. What are your thoughts on this, ladies? Perhaps I'm not a shoe person but I've always stuck to shoes that are practical and wearable. No skyscrapers heels for me unless it's an event (which few & rare in between) and I'm almost always in my ballet flats! My favourite type of shoes are low heeled ankle boots, they offer comfort and effortless chic (in my humble opinion) :) and while I don't own any Marant Dicker boots (that I so badly want) I have a few very simlar pairs by Ash oh and not to mention my new love: the Acne Pistol boots! I only own 1 pair of 5" heels and they come with ankle straps to keep my feet in. I think at 5'2 I'm best off with 4" and below heels otherwise they start looking like I'm on stilts! I really love Reed Krakoff's shoes - they are classic with an edge and are always comfy when I try them on. If only they weren't so expensive! Believe it or not, my Halogen wedges went AWOL! *sob* I've been on the phone with Nordstrom for the past 2 weeks. It seems the courier driver who is MIA along with my AWOL wedges decided to keep them. Nordstrom has organized to send another pair to me and thankfully, they threw in free shipping. Fingers crossed, they'll pay the duty as they'd promised. I think you may have a high arch, S. If that's the case, you won't be able to wear totally flat shoes. Have you thought of buying a slight wedge or court heels for comfort? Hope you, A & E are doing well. Up until two years ago I was one of those struggling hobbling women, what an idiot. Giving up high high heels was one of the best decisions I've ever made! The furry ones - an unusual take on furry warm high slippers for the house? Nop. Not selling it to me at all. All the Reed Krakoff ones are nice - wearable, interesting but not silly. I suppose the effect is for the catwalk after all it's not a good look to get stuck in the cracks of the pavement, Chanel or no Chanel (how insanely high are those)? I'm a huge fan of ridiculously tall heels, but I never buy a pair I can't walk in so I always go for chunky heels & wedges, I can't do stilettos at all! I think seeing a woman hobbling along, clearly unable to walk in her shoes is so unattractive, walking confidently in total flats is much better than stumbling around in 6 inch heels! Saying that though, I can't wear flats at all, they are torture on my calfs, I find heels with a few inches to be much more comfortable. NOOOOOOO!!! Please tell me that I misread that you love having the Celine furballs?! Oooooohhh..... love those Isabel Marant sandals towards the end! They look walkable but very different and new from anything else being offered. Celine did a gorgeous high heeled wedge-like pump for Spring but those furry ones are just awful. I think certain major desginers and couturiers will always have a license to kill - sorry to thrill with their runway shoes. And as long as celebrities are seen in sky high heels, then their influence will always be strong enough to keep these styles being made. However, change must be coming since even Victoria Beckham showed flats by Manolo! I mean if you didn't have to carry shopping, lunchboxes or even your own handbag, why not wear 6" heels all the time?! Hope the retailers realise there are more and more women looking for more reasonable but stylish heels. I prefer 3" inches personally and 3.5 for special ocassion - 4" only if there's a little platform. Being so small this is really the maximum I'm prepared to wear because I have a horror of the *short-woman-trying-to-look-tall* look lol! Love the first two flat pairs can't wait to get back into sandals! I am completely smitten with those Chanel heels and Isabel Marant sandals. I was hoping the crazy platform trend would have died off by next spring but sigh it looks like it's here to stay. Is it just me or does it seem like shoes are getting higher and higher these days? I remember a time when anything over 4 inches was already considered skyscrapers and now my goodness, 6 inch shoes to balance on! Shoes and bags are definitely a weakness. I like how clean Reed Krakoff's shoes are- even when he works with fur he exercises restraint, which love.